Thomas Gamble was born about 1848 in Ireland, and died December 17, 1911, in Hopeton Street, Yale, Waterloo Co., Ontario, Canada, at about age 63. He is the son of William Gamble of Ireland, and Jane Latimore of Ireland. Thomas Gamble and Mary Dorcas Irwin were married June 6, 1876, in Guelph, Wellington Co., Ontario, Canada. Lucinda Jane "Jennie" Gamble: Born April 3, 1877, in Goderich, Huron, Ontario, Canada; Died Unknown. Married September 18, 1907, in Toronto, York Co., Ontario, Canada, to Edward Dallimore: Born April 15, 1876, in York Co., Ontario, Canada; Died February 2, 1929, in York Co., Ontario, Canada (age 52). Buried in St John's Cemetery. Mary E. Gamble: Born about 1879 in Hope Twp., Durham Co., Ontario, Canada; Died Unknown. Married (1) to Joseph Haskill: Born about 1867 in Hope Twp., Durham Co., Ontario, Canada; Died July 5, 1899, in Durham Co., Ontario, Canada (about age 32). Married (2) December 12, 1906, in Port Hope, Northumberland, Ontario, Canada, to James Weatherup: Born about 1864, in Drummer, Ontario, Canada; Died November 19, 1909, Durham Co., Ontario, Canada (about age 45). William John Gamble: Born about 1880 in Ontario, Canada; Died Unknown. Alice Abigail Gamble: Born February, 1884, in Michigan; Died Unknown; Married October 26, 1904, in Durham Co., Ontario, Canada, to William Seymore Scott: Born July, 1879, in Clarke Twp., Durham Co., Ontario, Canada; Died Unknown. Olive Tressa "Ollie" Gamble: Born September 17, 1885, in Duplain, Clinton Co., MI; Died after 1921 in Unknown; Married February 5, 1919, in Toronto, York Co., Ontario, Canada, to John Rundle Marks Jr.: Born July 20, 1884, in Portsmouth, Ontario, Canada; Died after 1921 in Unknown. John's parents: John Rundle Marks of Pictin, Ontario, Canada, and Estella D. Jennings of Jefferson Co., NY. The parents are buried in Christ Church Anglican Cemetery, Kingston, Frontenac Co., Ontario, Canada. Thomas Gamble and Mary Dorcas (Irwin) Gamble divorced about 1890 in Ontario, Canada. Mary Dorcas (Irwin) Gamble then married Richard Bate. Richard Bate was born November 2, 1828, in Hartland Parish, County Devon, England, and died January 6, 1922, at Victoria Home, City of Lynden, Middlesex Co., Ontario, Canada, from senility at age 93. He is the son of Richard Bate of Parkham, County Devon, England, and Frances Pridham of Parkham, County Devon, England. Richard Bate immigrated to Canada West with his parents in 1843. Elizabeth Hill was born about 1825 in Stock Minsland, County Cornwall, England, and died July 6, 1875, in Port Hope, Durham Co., Ontario, Canada, at about age 50. She is the daughter of Unknown. Richard Bate and Elizabeth Hill were married August 11, 1852, in Port Hope, Durham Co., Canada West. Elizabeth Jane Bate: Born about 1856 in Brighton, County Sussex, England; Died Unknown. Joseph Bate: Born 1858 in Durham County, Canada West; Died after 1861 in Unknown. Richard Hill Bate: Born June 12, 1861, in Hope Twp., Durham Co., Canada West; Died after 1871 in Unknown. Mary Elizabeth Bate: Born 1863 in Durham County, Canada West; Died April 18, 1922, in Elgin, Ontario, Canada (about age 59). Buried in South Park Cemetery, Elgin Co., Ontario, Canada. Married November 25, 1885, in Durham Co., Ontario, Canada, to Mathew M. McNish: Born December 25, 1864, in Canada West; Died 1941 in St. Thomas, Elgin Co., Ontario, Canada (about age 76). Buried in South Park Cemetery, Elgin Co., Ontario, Canada. Edward Bate: Born about 1864 in Unknown; Died Unknown. Aurilla Jane Bate: Born May 19, 1865, in Port Hope, Durham Co., Canada West; Died February 2, 1927, in St. Thomas, Elgin Co., Ontario, Canada (age 61). Buried in South Park Cemetery, Elgin Co., Ontario, Canada. Married May 22, 1890, in Lindsay, Victoria Co, Ontario, Canada, to Robert Taylor Bate: Born November 1, 1862, in Port Hope, Durham Co., Canada West; Died August 19, 1934, in Elgin, Ontario, Canada (age 71). Richard Bate then married Ellen Dickson Newson. Ellen Dickson was born about 1830 in Upper Canada, and died March 31, 1897, in Port Hope, Northumberland and Durham Co., Ontario, Canada, at about age 67. She is the daughter of Peter Dickson of Unknown, and Ellen Unknown of Unknown. Unknown Newson was born Unknown, and died Unknown. He is the son of Unknown. Possibly Thomas Henry Newson: Born about 1832 in County Middlesex, England. Unknown Newson and Ellen Dickson were married about 1865 in Unknown. Edward Newson: Born 1867 in Unknown; Died Unknown. Leigh Larson note: This relationship is my guess. Ellen (Dickson) Newson then married Richard Bate. Richard Bate and Ellen (Dickson) Newson were married December 25, 1877, in Port Hope, Durham Co., Ontario, Canada. Richard Bate and Ellen (Dickson) (Newson) Bate had no children. Richard Bate then married Mary Dorcas (Irwin) Gamble. Richard Bate (age 68) and Mary Dorcas (Irwin) Gambell (age 56) were married January 12, 1904, in Port Hope, Durham Co., Ontario, Canada. Richard Bate and Mary Dorcas (Irwin) (Gamble) Bate had no children. Ada Gamble was born September 25, 1882, in Ontario, Canada, and died Unknown. She is listed as the adopted daughter of Thomas Gamble. Richard Bate was born November 2, 1828, in Hartland Parish, County Devon, England. Ellen Dickson was born about 1830 in Upper Canada,. Elizabeth Hill was born about 1825 in Stock Minsland, County Cornwall, England. Mary Dorcas Irwin was born December, 1847, in Hope Twp., Durham Co., Canada West. Helen J. Wilford was born March 19, 1846, in Canada West. Thomas Gamble was born about 1848 in Ireland. The 1861 Census for Durham Co., Ontario, Canada shows Richard Bate (age 28) born in England is a married Wagon Maker living in the Village of Port Hope. Also living in Port Hope are: Elizabeth Bate (age 26) born in England; Louis Bate (age 7) born in Upper Canada; Joseph Bate (age 3) born in Upper Canada; Alfred Bate (age 2) born in Upper Canada; M. Bate (age 1) born in Upper Canada; and Richard Bate (age 64) born in England, a Brewer. The 1871 Census for Durham East, Ontario, Canada shows Richard Bate (age 40) born in England is a Wagon Maker living in the Village of Port Hope. Also living in Port Hope are: Elizabeth Bate (age 26) born in England; Louis Bate (age 7) born in Upper Canada; Joseph Bate (age 3) born in Upper Canada; Alfred Bate (age 2) born in Upper Canada; M. Bate (age 1) born in Upper Canada; and Richard Bate (age 64) born in England, a Brewer. Elizabeth (Hill) Bate died July 6, 1875, in Port Hope, Durham Co., Ontario, Canada, at about age 50. Thomas Gamble and Mary Dorcas (Irwin) Gambell marriage record. The 1881 Canadian Census shows Thomas Gamble (age 37) born in Ireland, is a married Laborer, and is living in Hope, Durham East, Ontario, Canada. Living with him are the following, all born in Ontario, Canada: a married female, Dorcas Gamble (age 37); a female, Mary E. Gamble (age 2); a female, Lucinda Gamble (age 4); and a male, William J. Gamble (age 1). 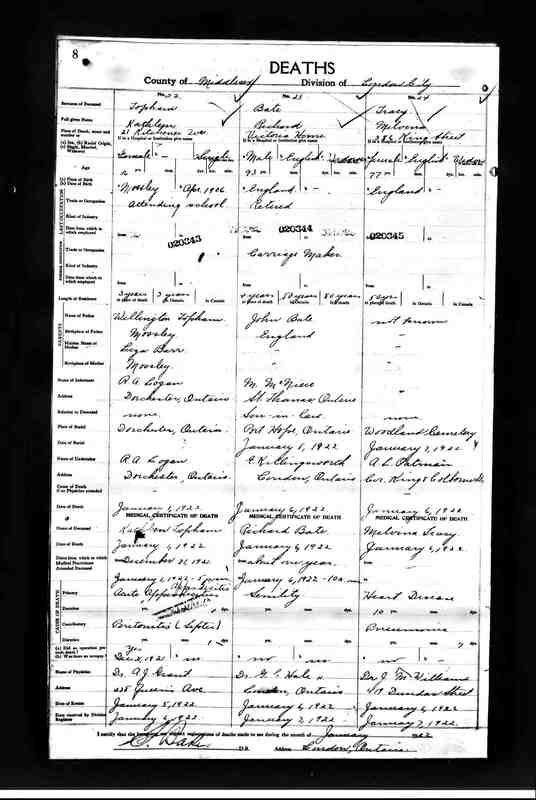 The 1891 Canadian Census shows Thomas Gamble (age 45) born in Ireland to Irish-born parents, is a married Laborer Machinist, and is living in Gault, Waterloo South, Ontario, Canada. Living with him are: his wife, Ellen Gamble (age 41) born in Ireland to Irish-born parents; and his daughter, Ada Gamble (age 8) born in Ontario to Irish-born parents. 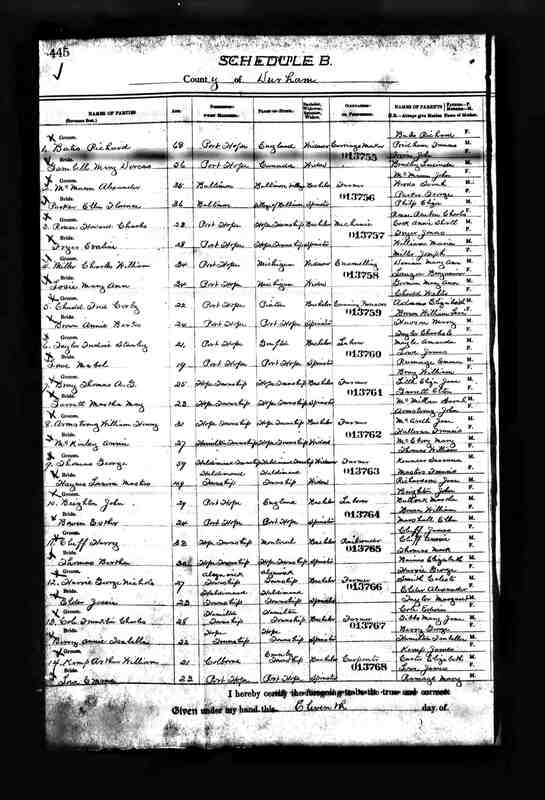 The 1891 Canadian Census shows Richard Bates (age 60) born in England to English-born parents, is a married Waggon Maker, and is living in Port Hope, Durham East, Ontario, Canada. Living with him is his wife, Ellen Bates (age 61) born in Ontario to English-born parents. Lucinda (Bradley) (Abbey) Irwin died July 19, 1896, in Hope Twp., Durham Co., Ontario, Canada at age 90. Ellen (Dickson) (Newson) Bate died March 31, 1897, in Port Hope, Northumberland and Durham Co., Ontario, Canada, at about age 67. The 1901 Canadian Census shows Dorcas is widowed and a Housekeeper for a widower, Richard Bate (age 68). The 1901 Canadian Census shows Olive Gamble (age 15) born September 7, 1884, in the United States is an unmarried Cousin of a Farmer, Ebenezer Irwin (age 39) living in Hope Twp., Durham East, Ontario, Canada. 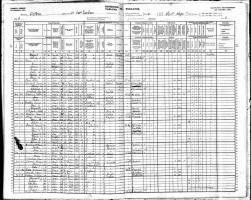 The 1901 Canadian Census dated April 9, 1901, shows Thomas Gamble (age 55) born July 12, 1845, in Ireland, is a married Labourer, and is living in Gault, Waterloo South, Ontario, Canada. Living with him are: his wife, Helen Gamble (age 55) born March 10, 1846, in Ontario; and his adopted daughter, Ada Gamble (age 18) born in Ontario. Richard Bate (age 68) and Mary Dorcas (Irwin) Gamble (age 56) were married January 12, 1904, in Port Hope, Durham Co., Ontario, Canada. 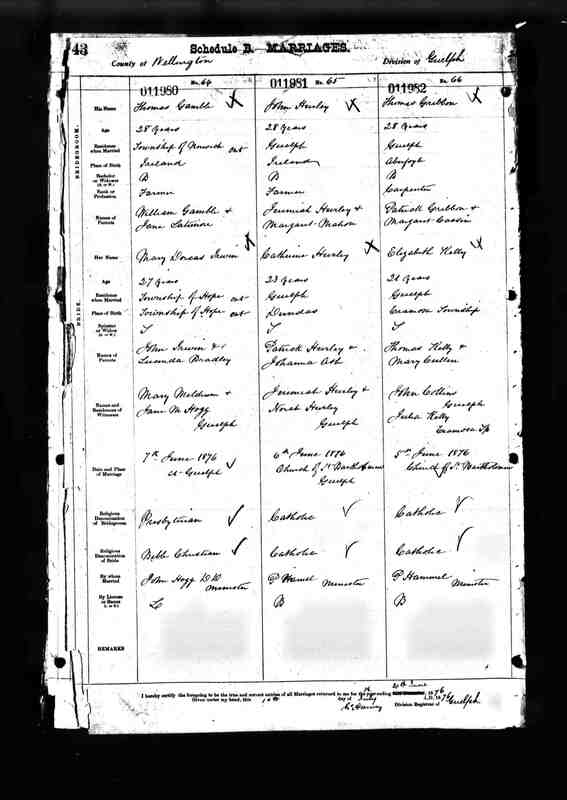 The 1911 Canadian Census shows Dorcas is married to Richard Bates. Olive Gambel also lives there. Mary Dorcas (Irwin) (Gamble) Bate died July 18, 1918, at 11 Well Street, Stratford, Perth Co., Ontario, Canada, at age 70. Buried in Section: Q; Lot: 298; Sub: 2, Avondale Cemetery, City of Stratford, Downie Twp., Perth Co., Ontario, Canada. Name on record: Dorica Bates. Cemetery interment date incorrectly listed as in 1920; should be 1918. Mary Dorcas (Irwin) (Gamble) Bate Death Record. Thomas Gamble died December 17, 1911, in Hopeton St., Yale, Waterloo Co., Ontario, Canada, at age 66. Richard Bate, age 93, a retired widowed Carriage Maker, died from senility on January 6, 1922, at Victoria Home, City of Lynden, Middlesex Co., Ontario, Canada. 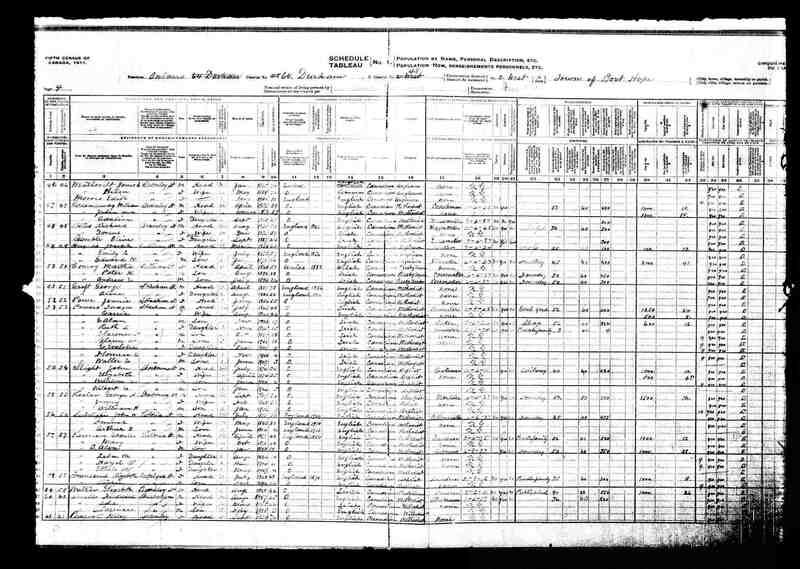 First husband, Thomas Gamble is found on the 1891 Census of Canada in Galt, Waterloo South, Ontario, Canada married to a Helen LNU Gamble, age 45 (Birth; 10 Mar 1846, Ontario). His occupation is listed as Labourer (Machinist). Also listed is an Ada Gamble, age 9 (Birth: 25 Sept 1882, Ontario). 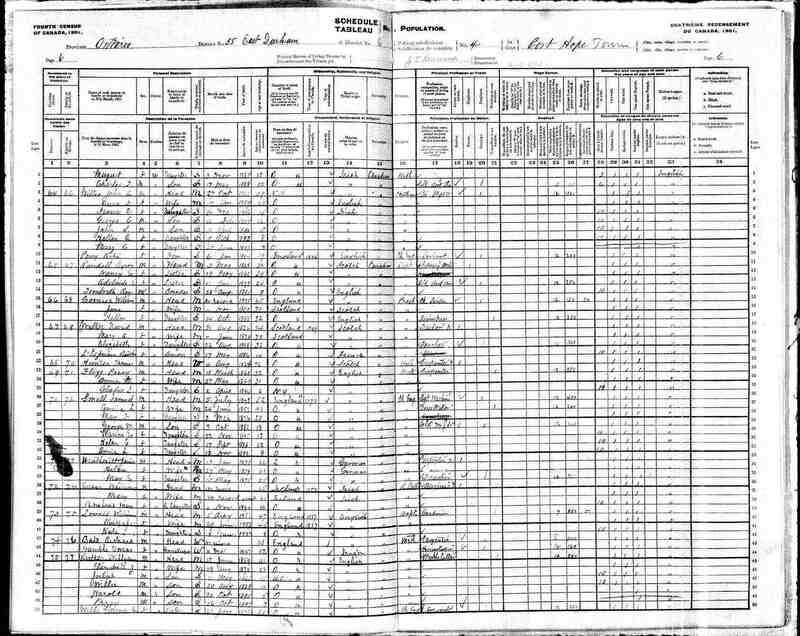 On the 1901 census she is listed as adopted daughter and Thomas, Helen and Ada are still in Galt, Waterloo South, Ontario, Canada. His occupation is listed as Labourer. 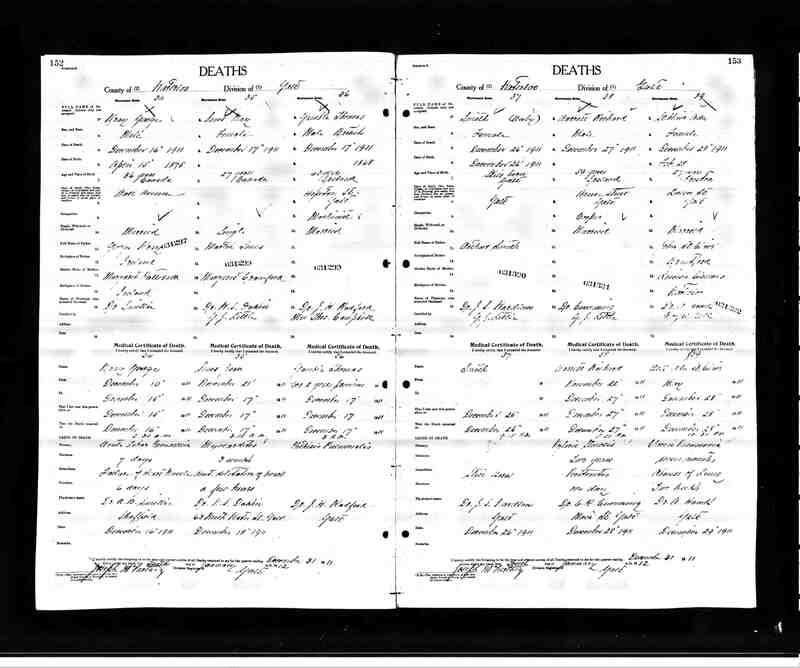 Of note on Thomas death record his occupation is listed as Machinist. I have not found anything else for Helen and Ada. (1) Lucinda Jane “Jennie" Gamble was born in Goderich, Huron, Ontario, Canada. In 1891, she is residing in Clarke, Durham West, Ontario, Canada with sister Mary at Aunt Jane Ann (Irwin) Gilmore family. In 1901, she is residing in Port Hope, Durham East, Ontario, Canada; Occupation: Servant. On 18 Sept 1907 in Toronto, York, Ontario, Canada, she married Edward Dallimore (15 Apr 1876, York, Ontario, Canada - 2 Feb 1929, York, Ontario, Canada; Buried 5 Feb 1929, St John's Cemetery), son of John Dallimore and Mercia Hiscock. They are enumerated on the 1921 census at 183 Woodvale Ave, York Township, York South, Ontario, Canada with the following Children: Edith Olive Dallimore (6 Jul 1908, York, Ontario, Canada), Herbert John Dallimore (9 Jan 1910, York, Ontario, Canada), Lillian Alburtia “lily” Dallimore (15 mar 1911, York, Ontario, Canada) and Marian Dallimore (c. 1917, York, Ontario, Canada). Edwards' occupation: Labourer. Note: In 1921, husband Edward Dallimore (Dallamore) is also listed residing with William and Alice (Gamble) Scott; Occupation: Labourer with daughter Lily, age 10. (2) Mary E Gamble was born c. Sept 1879, Hope, Durham, Ontario, Canada. 1891 residence same as sister Lucinda Jane “Jennie" Gamble. On 9 Mar 1897 in Port Hope, Durham, Ontario, Canada she married Joseph Haskill (c. 1867, Hope, Durham, Ontario, Canada – 5 Jul 1899, Durham, Ontario, Canada) son of David and Cynthia Haskill. On the 1901 census, she is residing with her in-laws in Hope, Durham East, Ontario, Canada, widow. On 12 Dec 1906 in Port Hope, Northumberland, Ontario, Canada she married James Weatherup (c. 1864, Drummer, Ontario, Canada – 19 Nov 1909, Durham, Ontario, Canada), son of James Weatherup and Helen Hatchell. In 1911, she is residing in Millbrook, Durham, Ontario, Canada; Domestic for Larma(r) family, widow. 1921, she is residing in Millbrook, Durham, Ontario, Canada; Servant Mr Thomas Wesley Larmar (widower), widow. 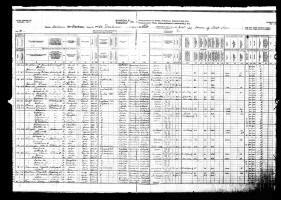 (3) William John Gamble, I did not find anything for him other than the 1881 census. (4) Alice Abagail Gamble was married 26 Oct 1904. Enumerated with husband and children: 1911, 252 Romeo, Stratford, Perth North, Ontario, Canada, Occupation: Blacksmith; 1921, 11 Well St, Stratford, Perth North, Ontario, Canada, Occupation: Blacksmith. Josephine Elizabeth Scott (B: 7 Sept 1905, Ontario, Ontario, Canada – 25 Nov 1992, Stratford, Ontario, Canada ) Married: Kenneth Alfred F Standen (4 Q 1905, Battle, Sussex, England) son of Alfred Standen and Lillian Coleman, on 7 Jan 1928, Perth, Ontario, Canada. Olive Pearl Scott (12 Feb 1909, Perth, Ontario, Canada - 8 Apr 2002, Stratford, Perth, Ontario, Canada). Lillian Dorcas "Lily" Scott (Oct 1910, Stratford, Perth, Ontario, Canada – 23 Jun 1944, Stratford, Perth, Ontario, Canada). Married: Irwin William Ellah (c. 1909, Milverton, Ontario) son of William Ellah and Clara Hainkel, on 18 Aug 1928, Perth, Ontario, Canada. Clarence Scott (c. 1917, Stratford, Perth, Ontario, Canada – 8 Jul 1998, Stratford, Perth, Ontario, Canada). 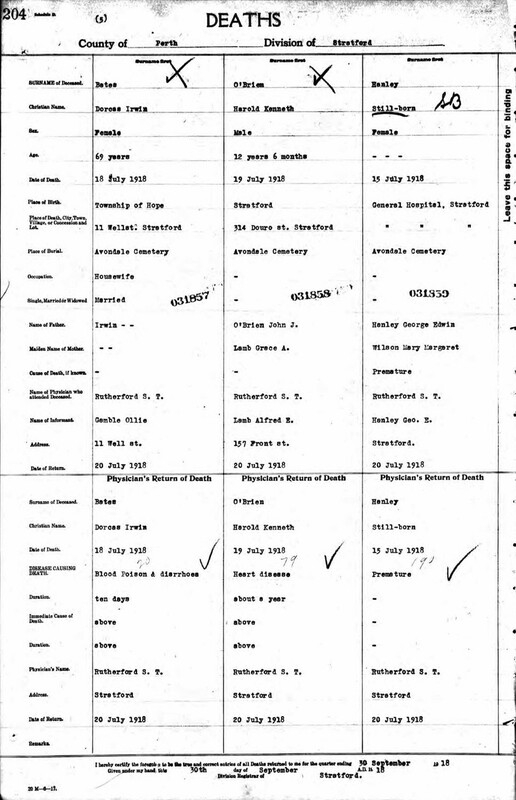 (5) Olive Tressa Gamble and her husband John Rundle Marks are enumerated in 1921 on Union St, Portsmouth, Kingston, Ontario, Canada residing with her husbands parents. John's occupation: Caulker. Second husband, Richard Bate(s), was a hard person to find information because his surname was spelled with and without the “s.” He was married two times before he married Mary "Dorcas" Irwin. I had six (6) children; four (4) males and two (2) females with his first wife. Wives: Elizabeth LUN Bate(s) (c. 1835-c. 1876) and Ellen Dickson Newson (c. 1830-1897). The informant on his death record was M. McNish, St Thomas, Ontario, Son-In-Law - Matthew McNeish/McNish who married Richards' oldest daughter Mary Elizabeth Bate(s). Poor man lost his wife Mary in April that same year.